Auto shoppers have been awaiting the release of the newly redesigned 2019 Kia Forte. While both compact sedans offer a great combination of standard comfort, convenience, and safety features, there are certainly some upgrades and changes for the 2019 model year. The 2019 Forte will feature a sportier look, first ever Intelligent Variable Transmission, and wide variety of up-to-date tech and convenience features. If you’re in the market for a budget-friendly compact sedan, then look no further than the 2018 and 2019 Kia Forte. To assist auto shoppers in deciding between these two great vehicles, here are some of the main similarities and differences between the two. For the 2018 model year, auto shoppers can choose a Forte with two different engine options. Standard in the Forte is a 147 horsepower 2.0-liter 4-cylinder engine that puts out 132 lb-ft of torque while providing drivers with a fuel efficient 29 city and 37 highway miles per gallon in models paired with an automatic transmission. For additional power, drivers should choose the 1.6-liter turbocharged 4-cylinder engine that boasts an impressive 201 horsepower and 195 lb-ft of torque while still providing a fuel efficient 23 city and 29 highway miles per gallon in manual models and 25 city and 30 highway miles per gallon in models paired with the automatic transmission. The newly redesigned 2019 Forte will feature a second-generation 2.0-liter Nu 4-cylinder engine which utilizes new Atkinson Cycle Technology and cooled EGR system which increases its fuel economy compared to previous models. This new powerhouse can be equipped with a 6-speed manual or Intelligent Variable Transmission. Horsepower and torque are expected to remain about the same from previous models, delivering an estimated 147 horsepower and 132 lb-ft of torque. We can expect a fuel economy improvement thanks to the IVT transmission. Both the 2018 and 2019 Kia Forte provide auto shoppers with a great overall value thanks to its wide variety of comfort and convenience features. The 2019 Kia Forte is expected to add more space where you need it most. An increase in the overall length by 3.2 inches is sure to add more legroom and cargo space. With up to 15.1 cubic feet of cargo space, the Forte has one of the largest cargo capacities in its class. Overall headroom is expected to increase thanks to the overall height increasing to 56.7 inches and an increased width to 70.8 inches. New models have a redesigned interior which gives the cabin a modern and open look. Kia upgrades the interior to a horizontal theme which gives the cabin a spacious feel and Kia conveniently places buttons below the 8-inch touchscreen display to give the Forte an uncluttered feel. Optional equipment in both the 2018 and 2019 models includes leather upholstery, power moonroof, navigation, and LED lighting. Kia easily blows the competition away by providing drivers with some of the most up-to-date and practical technology and convenience features. Drivers can pay attention to the road without distractions thanks to Bluetooth connectivity, Android Auto, Apple CarPlay, and technology that allows you to hear SMS text messages aloud through the speakers. New available features include a wireless charging station which is perched on the center stack, a 320-watt available premium sound system by Harman Kardon, and Kia Advanced Driver Assistance Systems (ADAS) which combines Blind Spot Collision Warning, Forward Collision-Avoidance Assist, Lane Keeping Assist, and Smart Cruise Control (SCC). 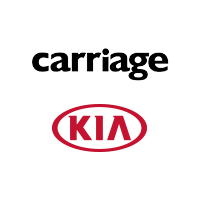 In order to learn more about the 2019 Kia Forte, visit Carriage Kia of Woodstock. Both the 2018 and 2019 Kia Forte beat the competition by providing auto shoppers with a great overall value in terms of comfort, convenience, tech, and safety features. Our friendly and professional sales staff will help you compare 2018 and 2019 models and trim levels in order to ensure that you drive off of our lot with the sedan that suits your driving needs and desires best.